Did you experience a major stressful event in your life like an automobile accident, surgery, or illness? Did you lose more hair soon after this stressful event? Although it may not be directly related, feeling an unusually large amount of stress or anxiety can cause your hair to fall out. Stress related hair loss is mostly caused by severe and long-term physical and mental stress. Connecting the hair loss with the stressful event, however, is difficult because it usually takes 3 to 4 months for your hair loss to show after experiencing the stressful event. Minor stressful events such as losing your car keys or getting stuck in traffic will not lead to losing your hair. Major stressful events, however, like having a baby or going through a divorce can create a change in your body that disturbs the normal hair cycle, leading to higher hair loss. In this article, I will discuss the reasons for stress causing hair loss, followed by the impact of stress on your hair. Next, I will cover the different forms of stress related hair loss and which type is more prevalent. I will conclude with recommendations on ways to prevent stress related hair loss. If you have a healthy head of hair, about 90% of the approximately 120,000 to 150,000 strands of hair in your scalp are in a growth phase, growing about 1/2 inches every month. After 2 to 3 years, hairs enter an inactive stage that can last for 3 to 4 months before they fall out and replaced by new hair. You lose about 100 hairs every day, and most of the time, you do not notice this normal hair loss. When you experience a significant physiological stress caused by a medical, diet, or lifestyle change, this can lead to more hairs going into an inactive phase and more hair being shed after 3 to 4 months. Examples of physiological stressors include taking an oral contraceptive, losing a significant amount of weight, undergoing major surgery, suffering a severe infection, and having a high fever. Severe emotional stress can also cause stress related hair loss. For example, going through a terrible divorce can lead you to experience physiological stress like not getting enough sleep, not eating properly, and losing over 10 pounds of weight. These can lead to an imbalance in your body that will cause you to lose more hair. The effects of stress related hair loss is different from hereditary related hair loss. While hereditary related hair loss typically causes bald spots or hair loss with a pattern, most stress induced hair loss causes your hair to thin throughout your scalp. This is because each of your 120,000 to 150,000 hair follicles behaves independently of each other and can be in different stages of growth. You will notice the most hair loss after washing or combing your hair and seeing handfuls of hair falling out from your scalp. However, by the time you see your hair shedding, new hair is growing and pushing out the hair in an inactive state. Although severe stress can cause hair loss, it is important to understand that not everyone will experience stress related hair loss. Some women in childbirth will shed much of their hair, while some will experience little to no hair loss. It is also difficult to predict who will experience stress induce hair loss and what stressors will cause it. What is known is that once you lose your hair in response to a stressful event, you are more likely to lose your hair again. Telogen Effluvium – Hair loss caused by Telogen Effluvium is most prevalent and results from experiencing severe physiological stress that makes your hair enter an inactive phase. In 3 to 4 months, the hair growing from these follicles fall out, causing an unusually large amount of hair to shed from throughout your scalp. Alopecia Areata – Hair loss from Alopecia Areata is the result your hair follicles being attacked by your immune system and making them drop out, often in large patches. Stress is one of several different sources found to trigger this hair loss form. Trichotillomania – This type of hair loss is entirely dissimilar from Telogen Effluvium and Alopecia Areata because it is caused by someone intentionally pulling out his or her hair as a way to deal with stress, boredom, anxiety, or depression. Understand the different types of stress induced hair loss. Visit your doctor to confirm that your hair loss is stress induced. Your hair should come back once the stress is eliminated. Eat at a minimum three healthy meals per day. Exercise regularly as this will help to relieve your stress. Talk to a therapist about your stress and anxiety issues. Relax often and give your body time to recover from any stressful event. Check your medications as some can cause you to lose more hair. Eat more protein because hair is made of mostly protein. Manage your hair carefully and avoid over-styling it. I discussed the most common type of stress related hair loss, Telogen Effluvium, and how this condition results from experiencing severe physiological stress that causes more hair follicles to go into an inactive stage. This typically leads to more hair falling out of your scalp 3 to 4 months after the stressful event. I also discussed various ways to reduce stress and anxiety and to care for and grow healthy hair. 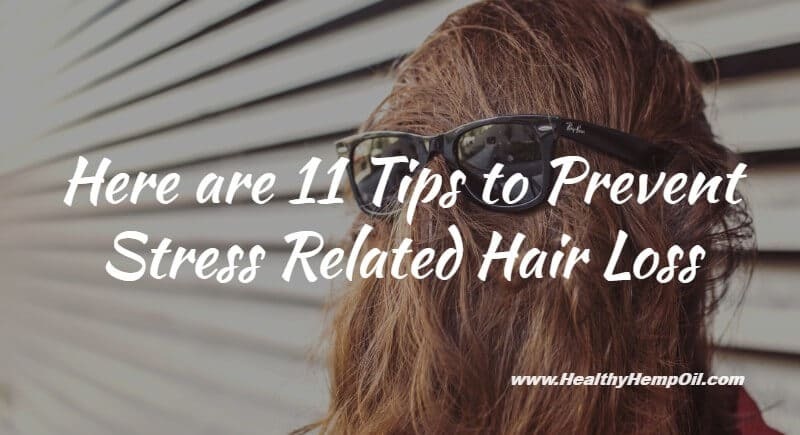 Now that you know about the connection between stress and hair loss, you are better prepared to recognize it and to seek a healthier lifestyle to reduce your stress levels. Have you ever experienced excess hair loss due to stress? What steps did you take to improve your condition and prevent it from happening again? Have you tried hemp hair products? Let me know in the comments.